The graphics in Rogue Leader are beautiful, with incredible detail on the ship you're flying and textures in the background. On one mission, you fly over an ocean covered planet with islands, during a sunset. The reflection against the water and the texture of the water looks amazingly real. 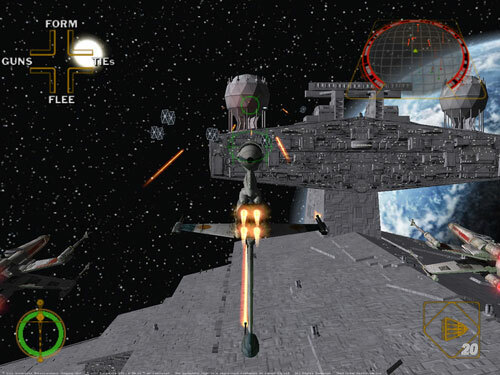 During the days when Gamecube was just being released, Nintendo often used Rogue Leader�s screen shots to show off their great graphics for the console because of this games outstanding graphics. Very few glitches occur too, I can�t even say I remember experiencing any. The sound is great, with great original Star Wars music by John Williams, and voice recordings by the actual actor who played Wedge Antilles in the movies, Dennis Lawson. The sound effects are awesome with surround sound, which I was able to use at a friends house. The sound test is really entertaining with surround sound because you get to hear the TIE fighter fly circles around you! Star Wars games always seem to have great sound, just like in the movies. The controls in Rogue Leader feel natural and are easy to learn, making this game easy to get the hang of fast. 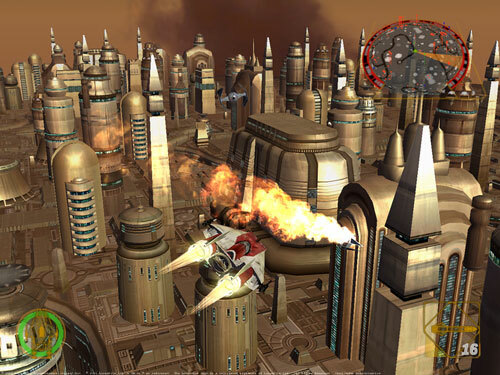 The gameplay is what you�d expect, fun intense Star Wars battles with nonstop action. Precise speed controls make it easy to speed up or slow down your ship. The farther you press in the �L� button, the faster you�ll slow down, and the slower you�ll go. It�s the same way with accelerating by using the �R� button. If you play the first few levels and don�t think they are intense, just wait till you get to the final few levels. The last few battle during the Battle of Endor will make your palms sweaty, for sure. 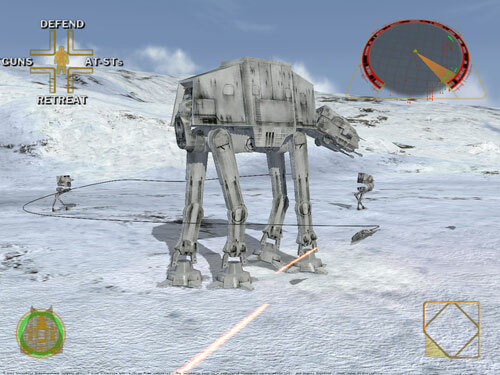 The Battle of Yavin and Hoth, and Endor are extremely fun because they are the three biggest battles in the movies and you finnally get to battle them in a single game. This game is too fun to miss out on. Numerous special features on this game make Rogue Leader enjoyable when you want to take a break from the battles for try something new. There is a music hall to listen to music, a sketch book, an audio commentary that can be heard in the background sound of levels, and my favorite, the ten minute Documentary that goes behind the scenes on all the steps of making the game. Also, there are tons of ships to unlock, which will eventually make your hanger crammed tight. There are five bonus levels that can be unlocked as well, including two that let you fly as Darth Vader against the Rebels. Rogue Leader is an extremely challenging game if you attempt to obtain all the gold medals and unlock all the special features. Otherwise, if you just want to beat the standard ten missions, it won�t take you more than a week. Most people will get bored of the game before they beat it because it is so challenging. I have only met one person who has beat it all, without cheating of course. If you persevere, you will get somewhere though. Rogue Leader lacks a multi-player mode, which hurts it�s lasting appeal, but if you�re looking for a challenging game, look no further! Beautiful menus with footage of the movies in the background!!! Only ten missions, not including bonus ones. Arguable: Game is in a sense, too challenging.